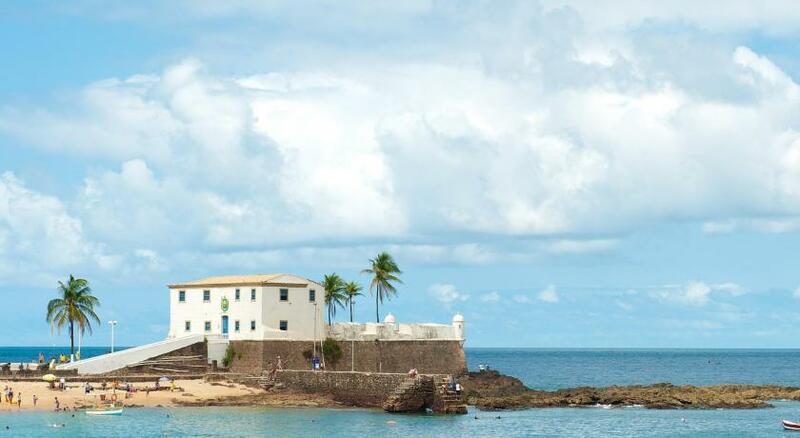 Lock in a great price for Grande Hotel da Barra - rated 8 by recent guests. Wonderful spot. Clean and comfy room. Beautiful view and area. Staff are friendly and attentive even when there may be a bit of a language barrier. I had a minor health crisis and the reception staff couldn't have been more helpful. The restaurant staff were very friendly and the service excellent. Location, professional and friendly staff. Breakfast.. value for money..
we paid extra for sea view room and it was absolutely woth it!perfect location and great view! Very nice location near a beach, great view on the sea. Good area, lively, people on the street until late. Spectacular view from our room. Nice pool. Clean rooms. Everyone very friendly and helpful. Extremely well positioned next to probably the nicest piece of beach along the Barra coastline. Our room (303) was simple but spacious and the bed was incredibly comfortable it was hard to get up and do anything. Breakfast is traditional but varied. It is definitely worth paying more for the sea view. The pool is a great size. There is a good selection of restaurants in the area many specialising in seafood and traditional dishes with some quite upscale dining experiences at still very reasonable prices. Public transport serves the area very well and it's easy to get a bus to pretty much anywhere. Although you will be hassled to take a cab as soon as you set foot outside of the hotel. For the price we paid we could not have asked for better location, service or quality. One of our top picks in Salvador.This hotel is ideally located on Porto da Barra Beach seafront, in Salvador, featuring a pool. Nearby, guests enjoy a colourful nightlife, shops and sunsets. Spacious rooms and breakfast are offered. Grande Hotel da Barra boasts large rooms with room service. All are air-conditioned and feature a minibar, cable TV and a bathroom with shower. Some rooms offer a view of the ocean. Grande Hotel da Barra serves a rich buffet breakfast with a varied selection of breads, cold cuts and cakes. International and regional cuisines are available at the restaurant. The bar serves refreshing drinks by the outdoor pool. The historical building of this hotel is air-conditioned and features a fitness centre and free WiFi. Therapeutic massages and beauty shop treatments can be scheduled at the 24-hour front desk. The tour desk can arrange tours, car rental and airport shuttle services. This 4-star hotel is located within a 15-minute drive from Pelourinho’s historical centre and Modelo Market. Deputado Luis Eduardo Magalhães Airport is 17.4 miles away, and Shopping Barra can be reached within a short 5-minute walk. Grande Hotel da Barra has been welcoming Booking.com guests since 3 Jun 2009. When would you like to stay at Grande Hotel da Barra? Equipped with air conditioning, this room contains a cable TV, a minibar and a bathroom. Tastefully styled, it provides a desk and a safe. Private parking is possible at a location nearby (reservation is not needed) and costs BRL 20 per day. House rules Grande Hotel da Barra takes special requests - add in the next step! Grande Hotel da Barra accepts these cards and reserves the right to temporarily hold an amount prior to arrival. Quite dated. Bad service in bar and restaurant with long waits for drinks. Waiter coming to room and intimidating for a tip. Not good!!!! A clean place and friendly staff. Air Con could be stronger , I always have this issue at this hotel. Hotel is older, and they do try to keep it up, but age is showing. Towels in rooms need replaced. The decor is a little tired. I think it is time for refurbishment. During our stay, there are been some maintenance works just in front of our windows. We were not be prevented of it and so it is not fair, but we have been got compensation by staying one more afternoon in our room. The hotel has seen better days and is in need of an upgrade. There is only one elevator. The hallways are dark and dour. The bathroom was rather tight. We had a pool view and were unable to upgrade to an ocean view. The breakfast was OK although the staff not so eager to replenish the items that had run out. The beach in front of the hotel was super busy with hardly room to stand, where one is continuously hassled by pushy vendors. The restaurants in the area cater to a variety of clientele, with the good ones being rather pricey and of dubious quality. The area is extremely busy, especially at night, with a mostly young male crowd, straight and gay, loudly parading around while drinking beer or caipirinhas that are available from street vendors. room was not clean and even after cleaning nothing really changed :( there was a 5 cm gap in balcony door and broken mirror which nobody cares about. safe was making a beeep soud all the time (opened or closed)and it seems thats the way it. The room was not clean.